As long as you're not in the immediate landing path, meteorites are really fascinating. Over the past century, The Meteoritical Society has confirmed 606 eyewitnessed meteorite landings around the world. Designer Sebastian Sadowski maps them all out in a great interactive infographic that's tons of fun, until you realise you're a meteorite's sitting duck no matter where you live. 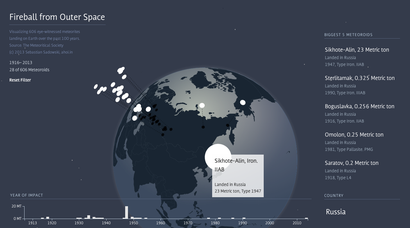 The infographic reveals some interesting data: 1946 was the year with the greatest amount of meteorite impacts (by weight), while the heaviest single meteorite of the past century, a 23,000kg monster that landed in Siberia, hit earth in 1947. All that space rock hitting earth in the postwar era must have really put people on edge.